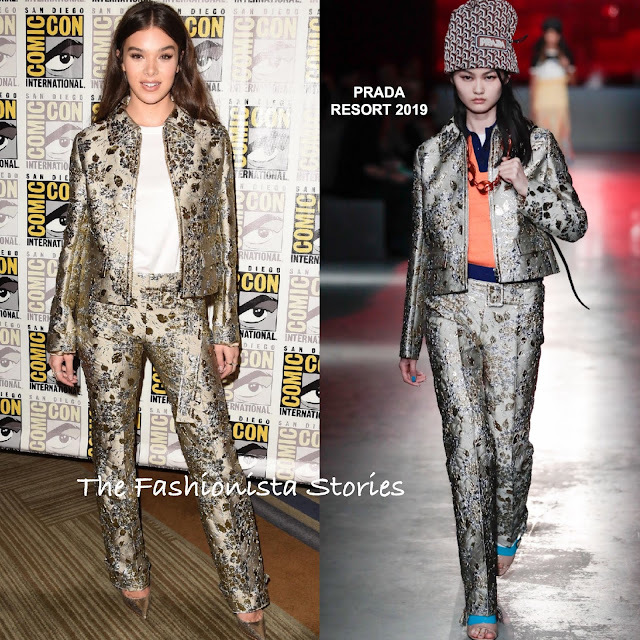 Hailee Steinfeld took a quick break from her tour to promote 'Bumblebee' during the 2018 San Diego Comic-Con press line on Friday(July 20th) at the San Diego Convention Center in San Diego, California. She posed for pictures at the event wearing a PRADA RESORT 2019 champagne embellished jacket with the matching belted waist trousers. She played down her statement embellished suit with a simple white t-shirt underneath. The pants needed to be hemmed but I liked this look on her. Off-the-shoulder tresses, a selection of gold rings and gold pumps finished up her look.